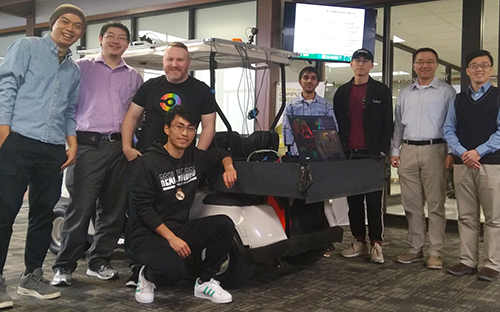 UNT Engineering has received a $360,000 Research Experience for Undergraduates grant from the National Science Foundation to host camps on vehicular edge computing and security for the next three summers. The 10-week camps will be open to 10 students who come from populations underrepresented in the computer science industry and/or institutions without the ability to conduct research in this area. Associate Professor Song Fu and Assistant Professor Qing Yang are the camp directors as well as the principal investigators on the autonomous car project in UNT’s Department of Computer Science and Engineering. They explained that, unlike industry, their autonomous cars would be linked to all other autonomous cars creating a network through which vehicles can get a better sense of their surroundings from a multitude of sources. Students also will explore the security aspects of the system. Fu added that students selected for the summer camps will be investing in the future of the transportation industry. He said that in the next decade he wouldn’t be surprised to see his research being used and autonomous cars on the road. There will be a need not just for mechanics, but computer engineers. Students selected for the program will receive a $5,000 stipend, live on campus and receive all materials needed for their research. Applications for this summer’s program are due no later than March 31. Students can apply here.